Rendering of proposed building at 38-42 West 18th Street in Manhattan. Image Credit: Morris Adjmi Architects. Morris Adjmi-designed proposal would be taller than previous approvals, but would not include any additions to existing buildings. 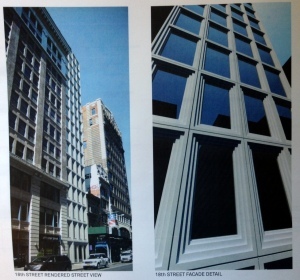 On September 23, 2013, the Landmarks Preservation Commission considered a proposal for two existing buildings and a vacant lot at 38-42 West 18th Street in the Ladies’ Mile Historic District. Landmarks has already voted twice to approve developments at this site in recent years, once in 2001, and once in 2008, but neither project came to fruition. The current proposal, unlike the previously approved ones, would not include any additions to the existing historic structures at 40 and 42 West 18th Street, but the new through-block building would be taller than in the earlier plans. The existing buildings would be restored as part of the plan, with much of the facade materials requiring complete replacement. The new building is planned for residential use, with three stories of commercial space at the base. The Drive to Protect the Ladies’ Mile District’s Jack Taylor spoke in opposition to the project, and said the restoration of the existing building should not be used as incentive to permit the project, because the same owners allowed them to “reach the stage of virtual demolition by neglect.” Michele Golden, of the Flatiron Alliance, found the proposal architecturally interesting, but inappropriate for the historic district, and too tall for the mid-block site. Nearby resident Janice Olshever opposed the project for reasons of design and scale, and said it would negatively impact the district. The Historic Districts Council also asked that the plan not be approved as proposed. Landmarks Chair Meenakshi Srinivasan stated that Manhattan Community Board 5 has issued a resolution recommending denial. Srinivasan opined that the proposal should be lowered should be lowered on both facades, particularly on 17th street, which she recommended be lowered to 150 feet. Commissioner John Gustafsson also agreed that the new building would be too dominant on 17th Street. Commissioner Diana Chapin thought that the building could be lowered, but should not align with adjoining cornices. Commissioner Fred Bland heartily endorsed the plan as proposed, calling it a positive contributor to “the vital City,” and arguing that the true threat to historic districts was “banal design.” Commissioner Christopher Moore agreed with Bland’s assessment, calling the proposal “intriguingly appropriate.” Commissioner Michael Goldblum found the project compelling, but not yet ready for approval, and suggested that the two facades be tied together in some manner. Chair Srinivasan asked the applicants to take commissioner comments under advisement, and return to Landmarks at a later date with a revised proposal. LPC: 38-42 West 18th Street, Manhattan (16-1461) (Sept. 23, 2014) (Architect: Morris Adjmi Architects).